Yacutinga Lodge and its Wildlife Refuge are located on the Upper Iguazú River, on the northeastern extreme of Argentina, only 60 km away from Iguazú Falls. Iguazú National Park, in the northernmost area of the province of Misiones, is a region of wide rivers, reddish clay soil, mild (subtropical) weather, and mainly of luxuriant forests with bright green colors, rich in giant old trees. These Conservation areas located in the border between Argentina and Brazil have pristine cores of subtropical forest, and bear more than 2,000 species of identified vascular plants and more than 400 species of birds, mammals and reptiles. 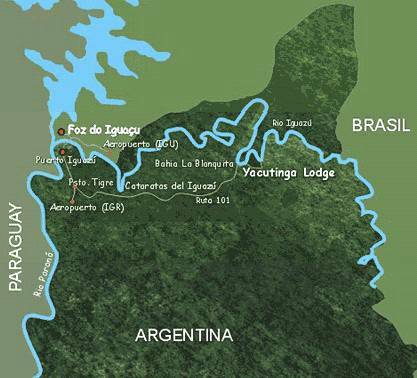 Access to Yacutinga Lodge from the cities of Foz do Iguazú or Puerto Iguazú is easy, since there are airports in both cites. Once you get to Yacutinga you will feel surrounded by the sounds and details of Misiones Forest. 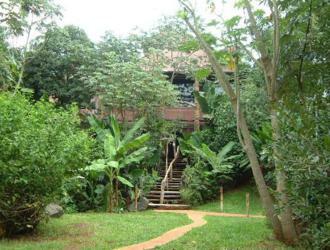 Yacutinga Lodge has been designed to offer the highest comfort possible at the heart of Misiones Forest. Days 1 & 2 - Same as 3-Day package. Rates include: Transfers from Iguazu Airport or hotel to Raices and transfers from Raices to Yacutinga Lodge, all meals commencing with dinner on Day 1 and ending with brunch on the last day, all guided excursions. PLEASE NOTE that Yacutinga Lodge DOES NOT ACCEPT ANY CREDIT CARDS. Due to their location far away of any banking access or processing facility they cannot accept any credit cards. Sorry. Traveler checks are accepted. Time: During most of the year Argentina is three hours behind Greenwich Mean Time (GMT), during some weeks between Dec-Jan and Feb, there is a time difference of one hour between Brazil and Argentina. Electricity: The lodge produces its own electricity at 220 V (50 cycles) which is available from 6 PM to 8 AM. Rooms are equipped with battery lighting in case of electric failure; there are torches everywhere and very attractive fire-places. Health: It is a good idea to get a travel insurance policy in your country. The nearest medical assistance center (basic) is 7 miles from Yacutinga. 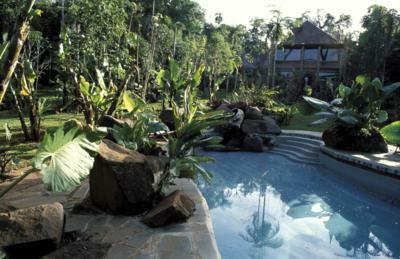 The nearest Hospital from Yacutinga Lodge is located in the Brazilian city of Foz do Iguazu, about 90 minute ride. You do not need any specific vaccine to travel to Argentina, but if you are including tropical areas like the Amazon or Pantanal in your itinerary, we suggest checking vaccination needs with you doctor. It is very important for us to know if you have any allergic complications. It is also very important for you to bring specific medication you might need during your stay at our Lodge. 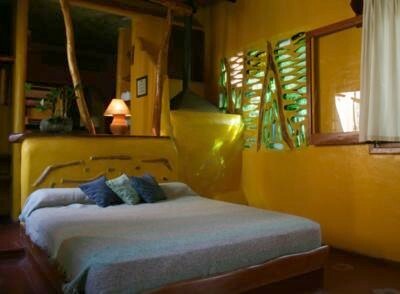 Rooming: Due the characteristics of the Jungle and tourist activities, which take place in a Natural Reserve, children under 10 are not accepted. The sleeping areas are located distantly from the Lodge Main Building. It is common to have a Cream-Backed Woodpecker nesting close to your room, and several other Natural situations, which are not included in any hotel star ranking system. At night there are also lightning-bugs, owls and of course, the impressive Milky-Way. Climate: The following chart indicates weather characteristics for the Iguazu area during the whole year. Important: Please note that weather conditions may vary. During the cold months of May, June, July and August it might be colder than expected. Clothing: The Lodge is informal. The idea is that you must feel like being in your own house with friends. Cotton clothes are a must. From October to April bring several T-shirts, Bermudas, at least one long-sleeved cotton shirt, a light sweater and don't forget sunglasses, bathing suite and a sunhat! During the rest of the year, the weather varies. It can be warm or cold - it is surprising how it changes! There can be hot winds from the Amazon or very cold winds from Patagonia or the Andes. So, if you are planning to visit from April to October you will need to pack more cloths: some T-shirts, one pair of shorts, one long-sleeved cotton shirt, one sweater, a turtleneck is a good idea, several socks, a light jacket (for June, July and August we suggest a warm jacket). And obviously, very comfortable walking shoes for all kinds of weather conditions during your trip. Packing: Since your luggage will be sent directly to the lodge, carry a backpack containing your personal belongings. You can leave large pieces at the locked offices at the meeting point in Raices Argentinas. Don't forger binoculars and cameras. If you have a 300 mm lens or more, it would be even better. Also bring insect repellent and sun block from December to March. And small plastic bags to cover your camera or binocular in case of humid conditions. The lodge provides you with rubber boots. If you have a flashlight, bring it.